In this case it is the opportunity of a freshly caught fish, wild rosemary island of VIS (Dalmatia) and a poorly equipped kitchen. In a frying pan that can hold the fish, pour the oil and garlic cloves. 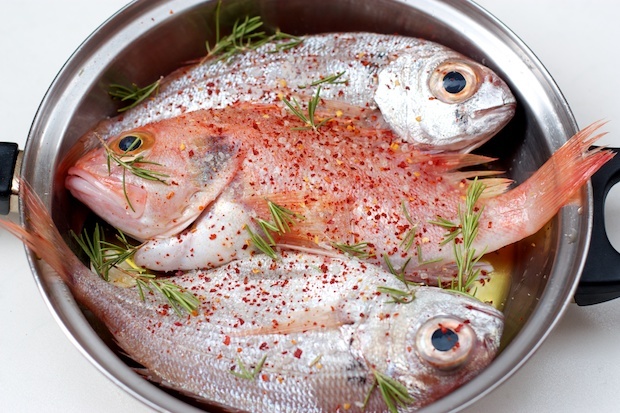 Place the fish, the spring of rosemary, salt and a little pepper. Put the pan on the stove at maximum temperature. When it begins to fry cover and lower the heat to low and simmer for 15 minutes. Turn the fish over and cook on the burner covered for another 15 minutes. Serve immediately after it is filleted to free it from bones.